For our last sew-in at Beazley, we worked feverishly trying to get as many pillows completed and ready to ship as possible. The folks at the center even planned a lunch for us – and it was GREAT! 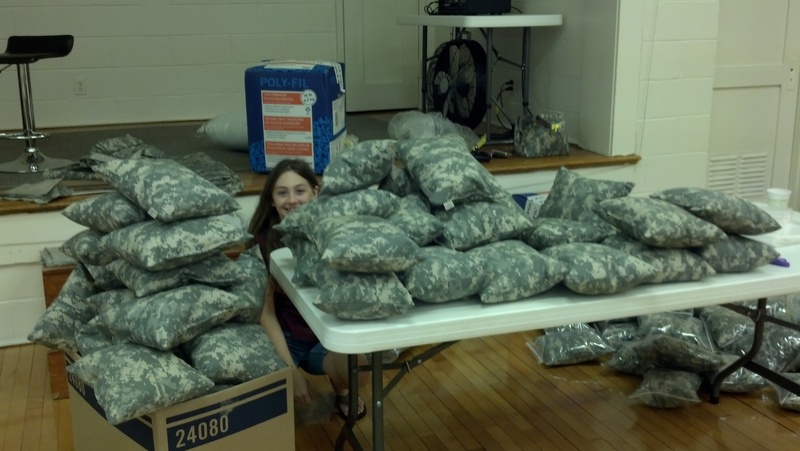 We heard through the grapevine that the 1st Infantry Division out of Fort Riley KS needed some travel pillows. 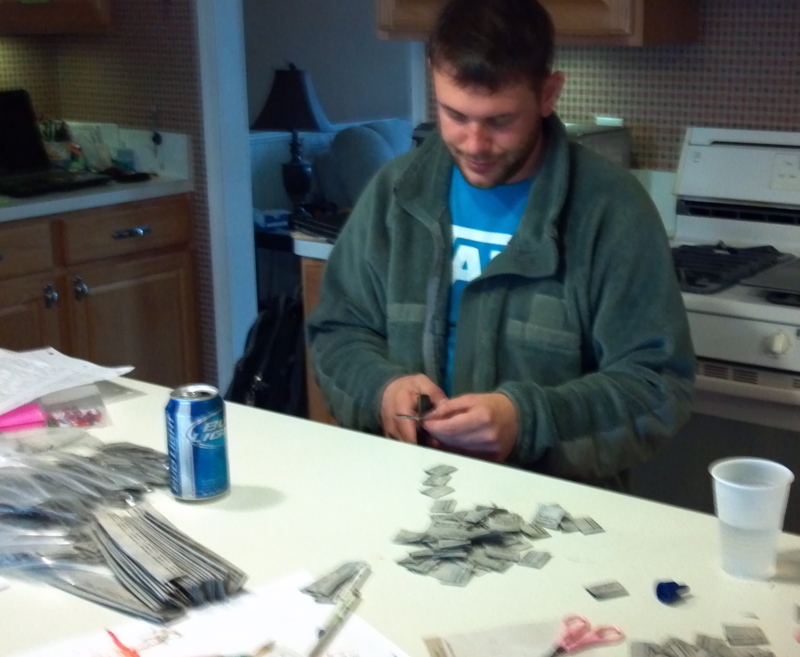 We spread the word and had more than our usual share of volunteers. Lastly, my 2 youngest and a neighbor help carry the boxes out on their way to Afghanistan. 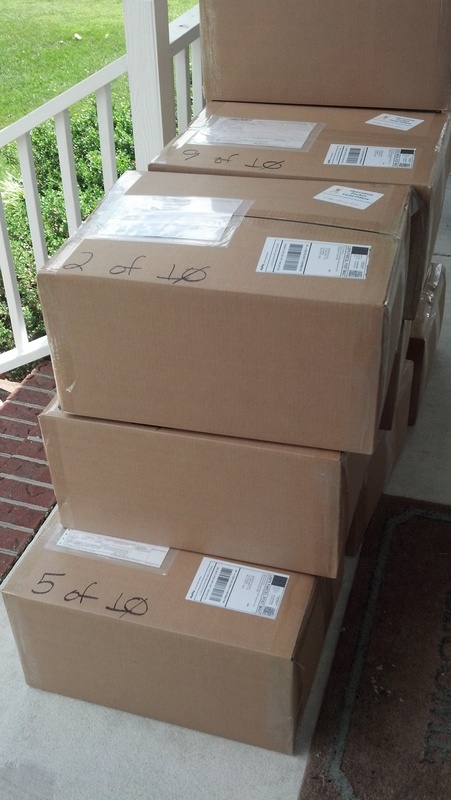 The boxes will be there in about 2 weeks or so. One of my contacts with the FRG folks at FT Drum contacted a good friend of hers at another Army post, and those folks contacted me. The result: lots more field pillows. 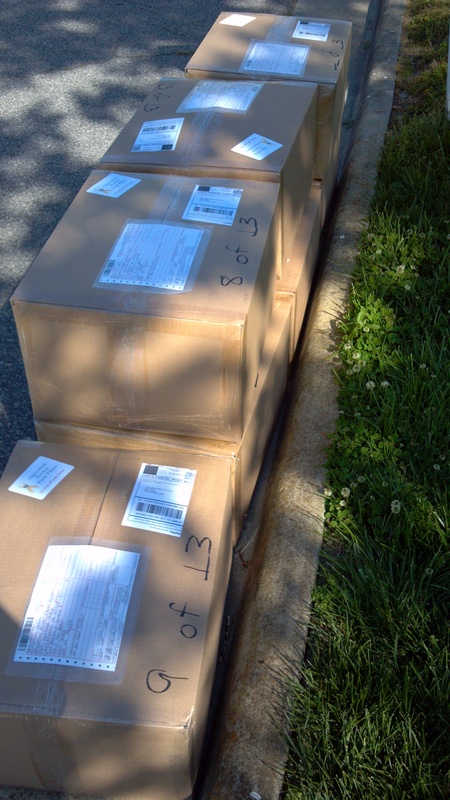 Here’s the second group of boxes full of ACU field pillows being shipped to our Marines in the Helmand province (totalling well over 500; lots but not nearly enough). To our wonderful Marines; I apologize in advance, ACU is all we have. But please take one of our field pillows and use it, knowing that folks back home care about you and want you to come home. With the outpouring of requests from folks who read Jennifer Caprioli’s article and passed it along to their Facebook friends, we have way more requests for our ACU field pillows than we have folks who work on them. If you’ve offered to help, wonderful! If you’re local to the Tidewater area, or know someone who is, and would like to volunteer to help us make pillows, we’d love to have you. If you’ve emailed me and asked me to send pillows to your Soldier’s unit, judging from the requests, it may take us awhile for us to get to your troop. If you’d like to begin your own pillow project, great! I’ve been telling folks to look for ACU fabric online; you won’t find it in any retail store. And there’s a good reason we choose the same ACU that our troops wear; it’s tough, strong, dense, and durable. That stuff wears like iron — and that’s just what our troops need. Our field pillows are travel size, about 10″ x 12″. 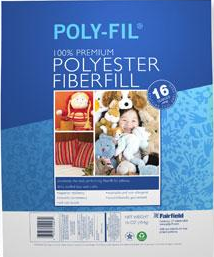 We use only premium polyfil by the Fairfield Processing Corporation; you can find it in any WalMart. Don’t even try to hand sew this stuff; save your hand sewing for the fleece pillows we send to Landstuhl. Just machine sew them shut after stuffing. Don’t even think about getting the cheap stuff; in this case, you most definably get what you pay for. A 50 oz. bag of stuffing will fill 18-20 of our pillows. If you’re not sure about starting your own pillow project, but want to show your support, contact a chaplain at the nearest post, and ask how you can help. Contact your nearest USO, contact Soldiers’ Angels. Do you know anyone who lives in Germany, near Landstuhl? My contact with Soldiers’ Angels there says they have a really hard time finding volunteers to help unpack boxes of goodies that have been sent for our wounded (including boxes of our pillows). If you know someone who lives near the hospital, and would be willing to become an Angel, please tell them to wander on over and sign up. Our troops need all the Angels they can get. It’s not always easy to contact folks up at FT Drum. And sometimes it does get old explaining again and again about our project, trying to verify that I really am who I say I am, yes, I really am a 10th Mountain mom, and asking for personal information about our troops; things would be a whole lot easier if I were physically in NY, and could just walk in and introduce myself. So I was pleased and surprised when I contacted the PAO (Public Affairs Office) at FT Drum, and my contact there, Jennifer Caprioli, referred me to the folks at Division for help with coordination. Since Jenn is a writer, she also suggested writing an article about Operation PFP, and that might help spread the word about the project. I found Jenn’s article online, and thought I’d share. She did a wonderful job and I love the photos she used. And it certainly did spread the word. I’ve spent all day answering emails and reading comments from folks around the country. I do have several suggestions for folks though; if you have a troop deployed: don’t forget to write to your soldier at least once a week, send him photos of your family, newspaper clippings, magazines, anything that helps him stay connected. If you don’t have a loved one deployed, find one of your own. Contact a Chaplain at the nearest post or base. Ask how you can adopt a troop. And devote some time at least once every day to your troop; keep a care package going and add to it when you find goodies you think he or she might like; always include a letter asking if anything special is needed or wanted, send a drawing the kids made in school, remind your troop that folks back home care and want him or her to come home safely. If you are outside Virginia, and want to start a pillow project of your own — great! Find the appropriate fabric for your sailor, soldier, marine or airman online. Gather up some funds, buy the fabric and premium polyester polyfil (we only use Fairfield stuffing), decide on the pillow size (we like 10″ x 12″), cut your fabric and make some pillows. Again, contact a local post Chaplain or USO, and ask for help getting your pillows to our troops. Our friends at Soldiers’ Angels can always use help, and they have chapters all over the U.S. Or visit the Soldiers’ Angels website. They always have ongoing projects that folks across the world can participate in, whether you want to adopt a troop or make a blanket for a wounded soldier. Spread the word to your friends, co-workers and the folks at church. Together, we will continue to let our troops know that they are not forgotten. And we won’t stop til they all come home. 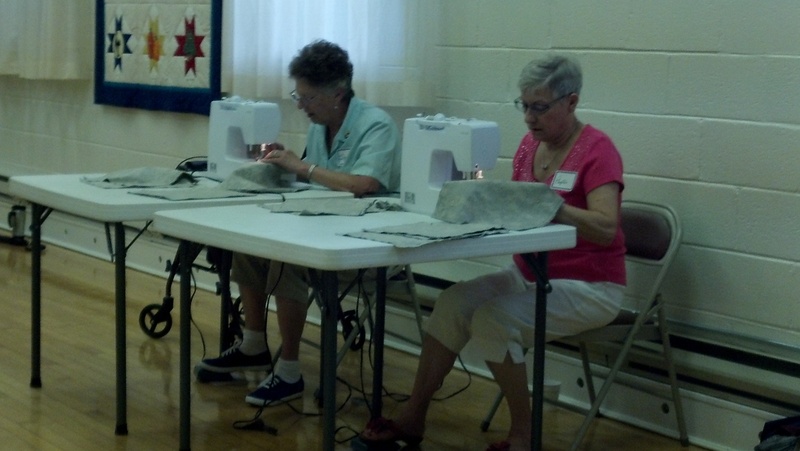 We held a smaller sew-in at the Beazley Senior Center yesterday, and yet still managed to complete nearly 200 ACU field pillows. 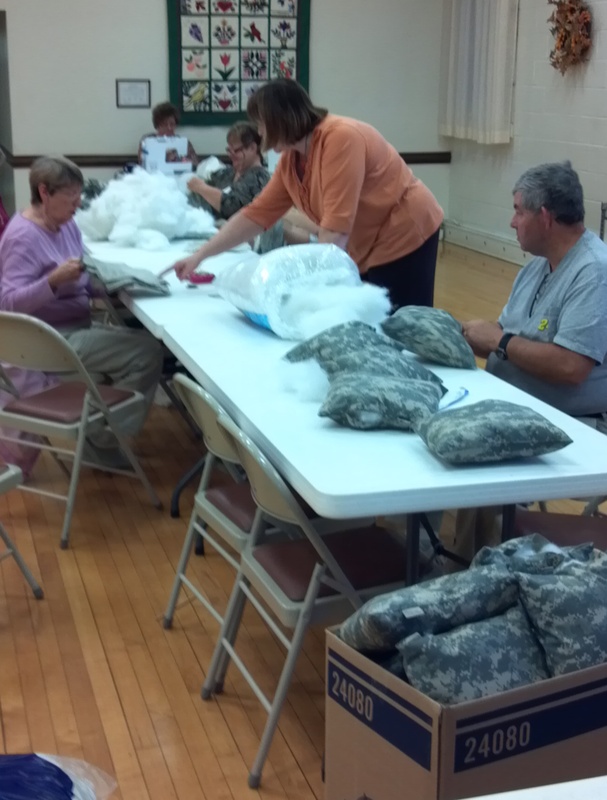 Along with hundreds more, this group of pocket field pillows will be headed to Afghanistan shortly. Resurrection Church in Portsmouth is sponsoring the sew-in next Tuesday, and they gener0usly offered me a booth at their Fall Festival to promote Operation PFP this past weekend. I brought all the small ACU key fobs with me, set up a booth with Nick’s picture on it (I swear, my Soldier is SO handsome!) and some info about the project. Folks stopped by all day long to either buy a key chain, drop a few dollars in the pot, or tell me about their own troop. 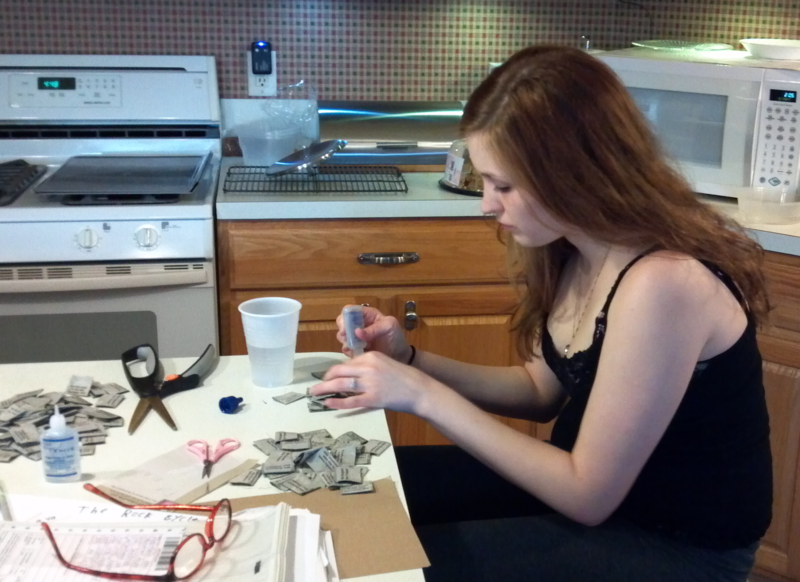 So, now we have a little more money for shipping, and we might even snag a few volunteers from that booth. Thank you, Eleanor! 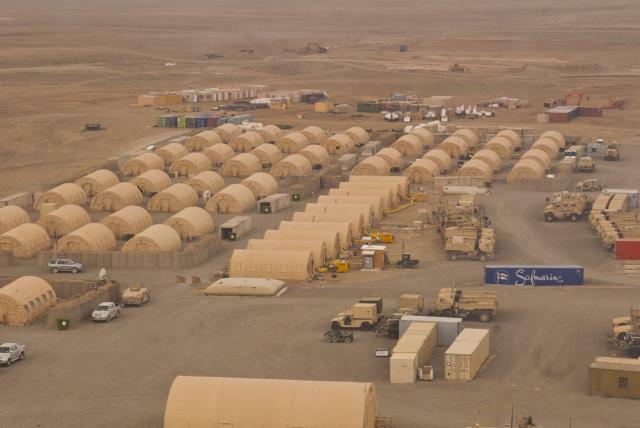 Operation PFP is made possible in part by my small business, Just For Baby Gifts, donations of ACU by the Carlisle Finishing Plant, fleece donated by Polartec, supplies donated by Brother International, and by the untold hours of work by hundreds of proud and grateful American volunteers.